These triple beam balances set the standard by which other mechanical balances are measured. Designed and tooled to withstand years of use, the Ohaus Triple Beams feature outstanding engineering, precision design, and solid construction. Spring-loading zero adjusts, and magnetic damping ensures accuracy and stability. 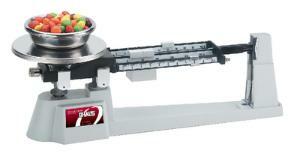 Notched scales have center-reading sliding pieces and are offset vertically for reading ease. These balances feature specific gravity weighing capabilities with an optional rod and clamp accessory (sold separately). A built-in security feature is also available separately. Calibrations for front, center, and back beams are as follows–10 x 0.1 g; 500 x 100 g; and 100 x 10 g. The balances include a five-year warranty. Ohaus model 710-00 features a removable pan to accommodate materials with various sizes and designs. Model 750-S0 has a fixed stainless steel plate and is designed for optimal attachment weights (sold separately). Model 760-00 is equipped with a stainless steel plate and tare.